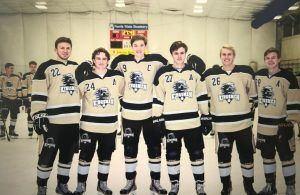 Senior leadership shined through for the Penn Kingsmen Hockey Team, as the Kingsmen avenged an earlier loss to South Bend St. Joseph with a thrilling 5-4 overtime victory. Penn fell to St. Joseph in overtime earlier in the season. Senior Jordan Lindzy scored the game-winner, zooming coast-to-coast to light the lamp in overtime. The Kingsmen started the scoring with goals from Ryan Calhoun and Nick Morlan. Penn battled back from a 3-2 deficit to pull ahead 4-3 on toals by Colton Shail and Nick Morlan. St. Joe tied the score at 4-4, forcing overtime. 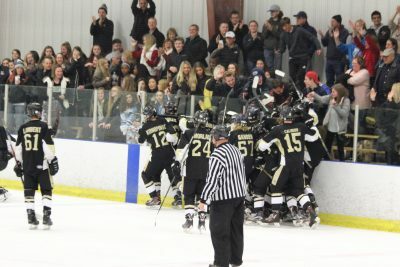 Lindzy’s goal in overtime sealed the Kingsmen victory. The Senior Leadership of Penn really shined. Colton Shail scored a goal and dished out two assists. Nick Morlan scored two goals, and Carson Cocquyt sparked the Kingsmen attack with four assists. Jordan Lindzy scored the game-winner in overtime.